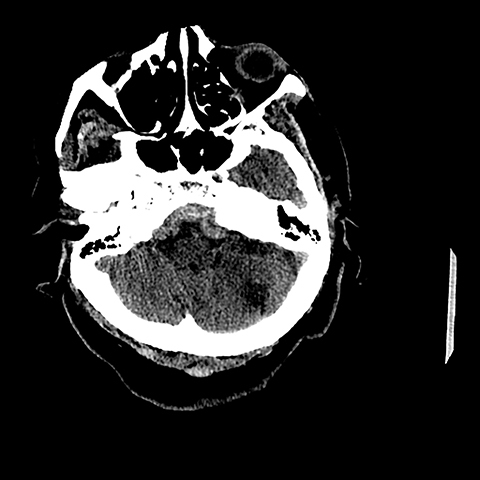 A 72-year-old female with a past history of a right frontoparietal stroke and residual left hemiparesis presented to the ER with a one-day history of headache and confusion. One month previously she had been diagnosed with a deep venous thrombosis in her leg and had been started on lovenox and Coumadin. There was no reported history of antecedent trauma. Physical exam, other than the residual deficits from her previous infarct, was noncontributory. Laboratory values were within normal limits given patient’s current anticoagulation status. 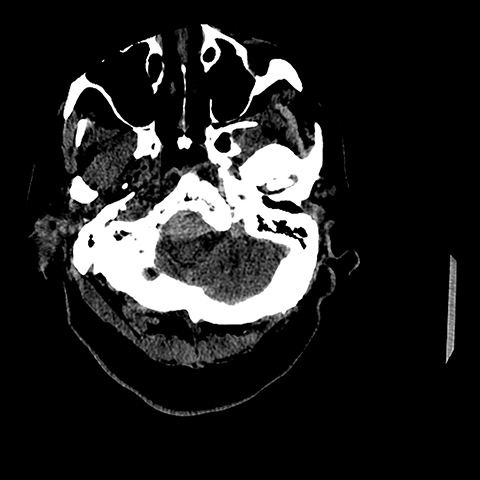 A noncontrast head CT was subsequently performed and demonstrated an area of extra-axial hyperdensity marginating the clivus and extending from the most inferiorly visualized aspect of the anterior foramen magnum cephalad towards the left and right cerebellopontine angle cisterns (Figures 1,2). 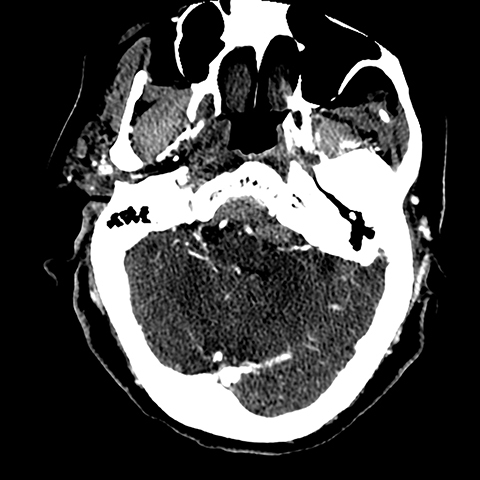 A spontaneous retroclival subdural hematoma was suspected. 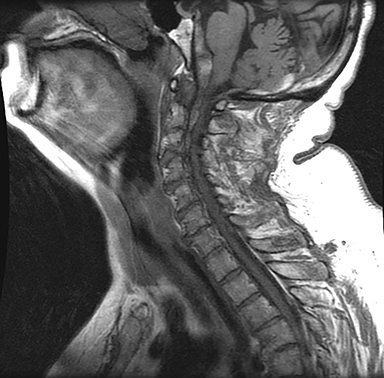 Less likely considerations included an extra-axial hypercellular mass such as meningioma, lymphoma or plasmacytoma. 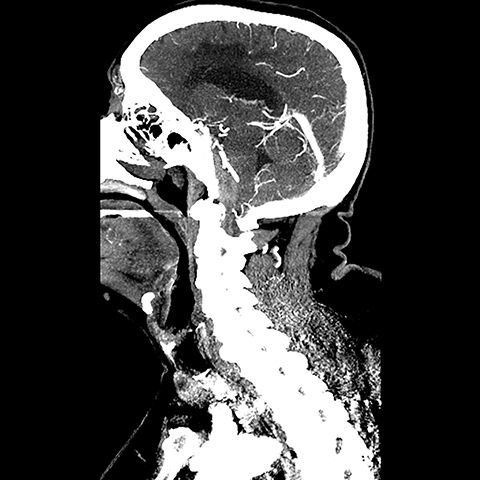 A CT angiogram of the head and neck was performed next to exclude any regional vascular anomalies, such as an occult arteriovenous malformation or dissection, as well as to assess for any abnormal regional enhancement. There was no evidence of an underlying enhancing mass or regional aberrant vessels (Figures 2,3). Elevation and dorsal displacement of the distal V4 vertebral artery segments and the basilar artery was observed (Figure 4). Anticoagulation was reversed in the ER with fresh frozen plasma and vitamin K was begun; the patient was subsequently admitted for supportive care and observation. 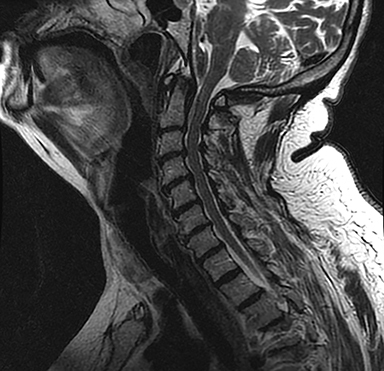 At that time, an MRI of the brain and cervical spine, ordered to ensure a bland nature of the hemorrhage and to completely exclude any underlying mass, demonstrated the hematoma to have predominantly low signal on T2 FSE images and high signal on T1, consistent with intracellular methemoglobin. There was dissection from the superior aspect of the clivus distally through the anterior foramen magnum into the ventral spinal canal. The hematoma was noted to overlay an intact, otherwise unremarkable tectorial membrane and to extend distal to the membrane attachment at the dorsal mid C2 vertebral body, consistent with a subdural location (Figures 5,6). As a final step in the workup, a four vessel cerebral angiogram, not shown, was done to exclude any small contributory distal vertebral aneurysms and proved negative in this regard. After an uneventful 10-day hospital course during which temporal evolution and progressive resolution of the hemorrhage was observed on a follow-up CT exam, the patient was discharged back to a skilled nursing care facility. DVT prophylaxis was reinitiated with subcutaneous heparin and a return appointment as an outpatient with the neurosurgery clinic was scheduled. In conclusion, though an uncommon entity, retroclival hematomas are an important diagnostic finding to make due to their potential for significant neural compression as well as their association with underlying osseous and ligamentous injury, especially in the pediatric population. Epidural hemorrhage, as seen in this group, will typically be constrained by an overlying attenuated tectorial membrane, partially stripped from the clivus and subjacent atlanto-axial junction. Subdural bleeding, in distinction, can diffuse freely into the posterior fossa and spinal subdural spaces and may be seen posteriorly and laterally at the level of the foramen magnum or extending below the mid axis body. Management is based on the extent of any neurological and soft tissue co-injuries. In their absence, care is expectant and conservative. Guillaume D, Menezes A Retroclival hematoma in the pediatric population: Report of two cases and review of the literature. J. Neurosurg: Pediatrics. 2006;105:321-325. Koshy J, Scheurkogel M, Clough L. Neuroimaging findings of retroclival hemorrhage in children: a diagnostic conundrum. Childs Nerv Syst. 2014;30:835-839. Myers D, Moossy J, Ragni M. Fatal clival subdural hematoma in a hemophiliac. Annals Emerg Med. 1995;25(2):249-252. Goodman J, Kuzma B, Britt P. Retroclival hematoma secondary to pituitary apoplexy. Surg Neurol. 1997;47:79-80. Casey D, Chaudhary B, Leach P. Traumatic clival subdural hematoma in an adult. J Neurosurg. 209;110:1238-1241. Ahn E, Smith E. Acute clival and spinal subdural hematoma with spontaneous resolution: clinical and radiographic correlation in support of a proposed pathophysiological mechanism. J. Neurosurg: Pediatrics. 2005;103:175-179. Tubbs R, Griessenauer C, Hankinson T. Retroclival epidural hematomas: a clinical series. Neurosurgery. 2010;67(2) 404-406. Meoded A, Singhi S, Poretti A. Tectorial membrane injury: frequently overlooked in pediatric traumatic head injury. AJNR. 2011;32:1806-1811. Guilloton L, Godon P, Drouet A. Retroclival hematoma in a pati1ent taking oral anticoagulants. Rev Neurol. 2000;156:392-394. Datta N, Chan K, Kwok, J. Posterior fossa subdural hematoma due to a ruptured arteriovenous malformation. Neurosurg Focus. 2000;8(6):ecp 1. Sever A, Rheinboldt M, Doshi P. Spontaneous retroclival subdural hematoma associated with anticoagulation. Appl Radiol. 2017;46(3):38-41. Prepared by Dr. Sever while a Radiology Resident, and Drs. Rheinboldt and Doshi while Radiologists in the Department of Radiology at Henry Ford Hospital, Berkley, MI.